It was not my original plan to review a second Greek yogurt in a single week. But Russ is holding down the non-yogurt fort with wit and swagger, as he's known to do. Neither was it in my original plan to take a single picture of the product at hand in soft focus with my crusty phone camera. I took nutrition pics as well, but they were perfectly unreadable—so here's a link for those if you're interested. Lord knows if you knew what Sonia and I went through yesterday, you'd be in awe that a review is being posted today at all. I won't go into the details, but I will tell you that our misadventures involved not one, but two, calls to the local police, both of which resulted in officers and squad cars on the scene, a house with no electricity and no water, a shady eviction case, multiple sleazy lawyers, and a national crime syndicate bent on benefiting the elite at the expense of the middle class and destroying all that's good in the process. I admit that last point may be a bit open to interpretation, but you'll understand when the epic novel comes out next year...or maybe I'll just blog about it somewhere other than here. At any rate, at some point during the course of those events, I opened up the fridge in our RV to find something refreshing to snack on and stumbled upon this, which was undoubtedly purchased along with the avocado yogurt on our last TJ's run. Cool, creamy, and super coconutty, this variety is the perfect Greek yogurt flavor. It is the antithesis of avocado yogurt—as surprisingly tasty as the avocado version was disappointing. 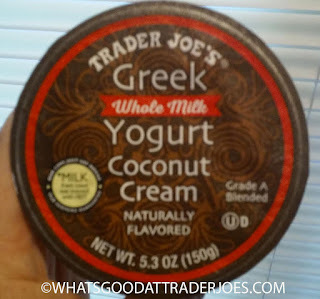 I've had plenty of coconut yogurts in my day, and plenty of coconut cream flavored desserts, and the flavor of this product is on par with the best of them, in my opinion. It isn't quite as sour and tangy as other Greek yogurt flavors, but there is still that distinctly Greek essence somehow—it's just more subtle here. It combines with the sweetness of the coconut in a unique way. There are coconut slivers/shavings throughout the product, which provide a nice little something to the texture. In short, if you enjoy coconut flavored desserts, I can't see you not liking this stuff. It sounds like you and Sonia had quite the day yesterday. I hope you're both ok! 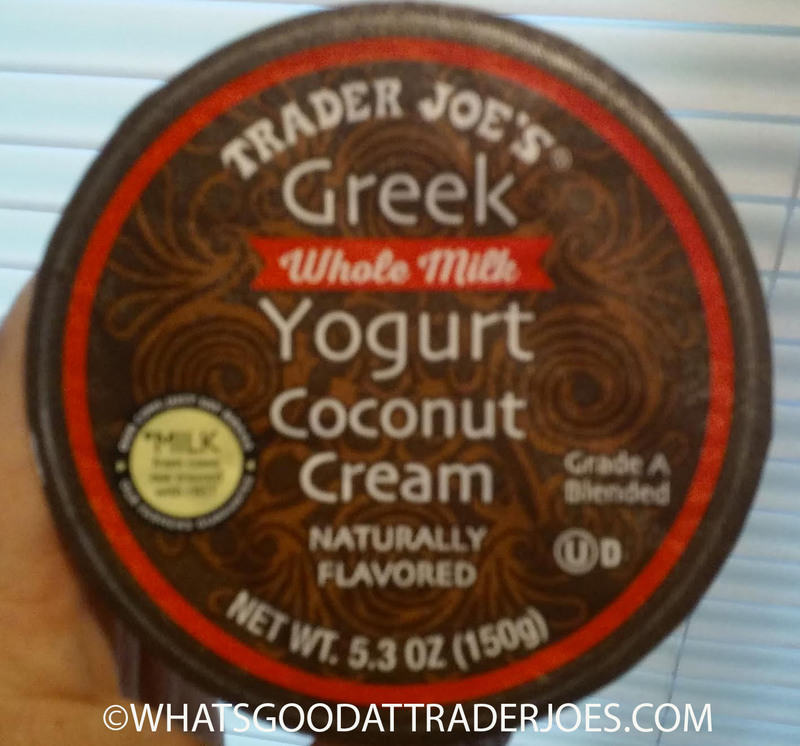 How does this yogurt compare to TJ's non-fat coconut greek yogurt?